A “groundbreaking” memoir about raising a special-needs daughter in an era of misinformation and prejudice—a classic that helped transform our perceptions (Publishers Weekly). It was my child who taught me to understand so clearly that all people are equal in their humanity and that all have the same human rights. Pearl S. Buck is known today for earning a Nobel Prize in Literature and for such New York Times–bestselling novels as The Good Earth. What many do not know is that she wrote that great work of art with the motivation of paying for a special school for her oldest daughter, Carol, who had a rare developmental disorder. What was called “mental retardation” at the time—though some used crueler terms—was a disability that could cause great suffering and break a parent’s heart. There was little awareness of how to deal with such children, and as a result some were simply hidden away, considered a source of shame and stigma, while others were taken advantage of because of their innocence. 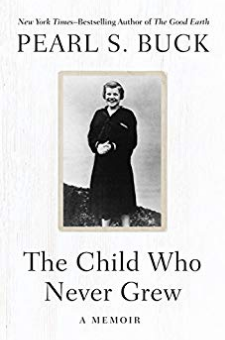 In this remarkable account, which helped bring the issue to light, Pearl S. Buck candidly discusses her own experience as a mother, from her struggle to accept Carol’s diagnosis to her determination to give her child as full and happy a life as possible, including a top-quality education designed around her needs and abilities. Both heartrending and inspiring, The Child Who Never Grew provides perspective on just how much progress has been made in recent decades, while also offering common sense and timeless wisdom for the challenges still faced by those who love and care for someone with special needs. It is a clear-eyed and compelling read by a woman renowned for both her literary talent and her humanitarian spirit. This ebook features an illustrated biography of Pearl S. Buck including rare images from the author’s estate.